Ultimate Fighting Championship (UFC) heavyweight titleholder Fabricio Werdum is a generous guy. In fact, “Vai Cavalo” is even helping his opponent, Cain Velasquez, with his pre-fight gameplan as both combatants gear up for a championship rematch at the UFC 196 pay-per-view (PPV) event, which goes down Feb. 6, 2016 inside MGM Grand Garden Arena in Las Vegas, Nevada. Werdum won their first go-round at UFC 188. 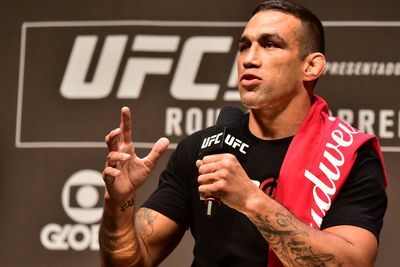 Much of the talk in the aftermath of Werdum’s upset was the poor conditioning from Velasquez, who was felled by his injury layoff, as well as the high altitude of Mexico City. “Vai Cavalo,” however, insists it was his superior skill set that turned the championship tables. A point he looks to prove in just over a month.